JAMES DANA. Pamphlet. The African Slave Trade. 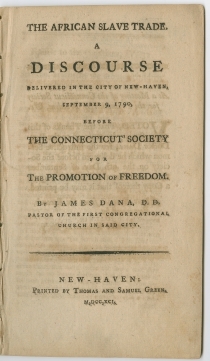 A Discourse Delivered in the City of New-Haven, September 9, 1790, before The Connecticut Society for The Promotion of Freedom. 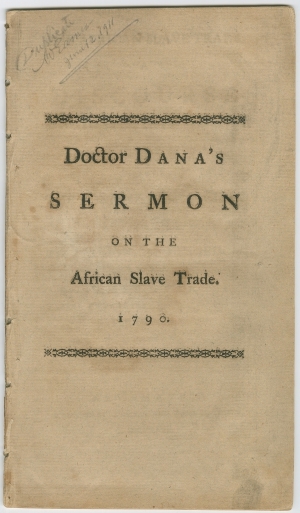 Half-title: Doctor Dana’s Sermon on the African Slave Trade. New Haven: Thomas and Samuel Green, 1791. Evans 23308. 33 pp., 4¾ x 8¼ in. Twenty million slaves, at £.30 sterling each, amount to the commercial value of £.600,000,000… traffic in the souls of men!!! 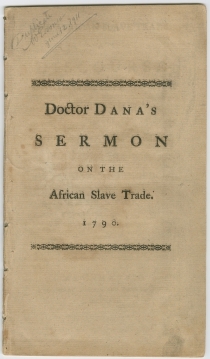 James Dana (1735-1812) was born in Cambridge, Massachusetts, and graduated from Harvard University in 1753. In 1758, he was ordained and made the pastor of the Congregational church in Wallingford, Connecticut. That caused a rift in Connecticut Congregationalism, as opponents viewed him as representative of the liberal school in Boston. 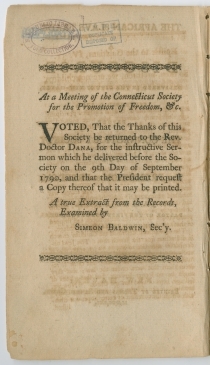 In 1768, the University of Edinburgh conferred on him a Doctor of Divinity degree. He returned to America, and gained support due to patriotic sermons in the period leading up to the American Revolution. 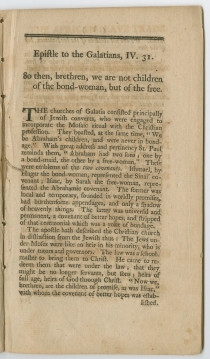 In 1789, he became the pastor of the first church in New Haven, remaining there until 1805. Ex-New York Public Library, with duplicate stamp on the verso of title page, and a pencil note by Wilberforce Eames, Chief of the American History Division, on the half title.